Is there anything a dog can’t do? They can run, jump, climb, fetch and even catch a bad guy. Working dogs are considered a valuable asset to police departments. 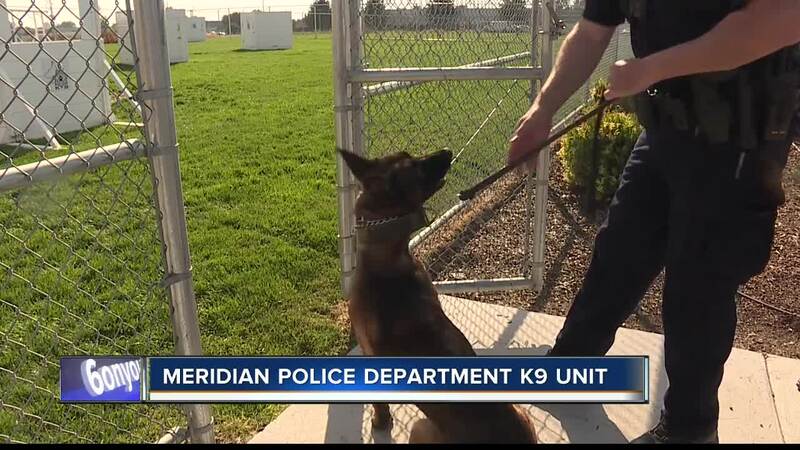 From odor detection or criminal apprehensions, every K-9 at Meridian Police Department serves a purpose. “essentially they’re a locating tool so if we’re looking for a hidden suspect or clear an area officers need to search uh for a dangerous suspect the dog will do that” says Lt. Berle Stokes of Meridian Police Department. K-9 Handler Dan Vogt is just one of five handlers in his unit. He has been with his partner, Gus for about a year and he enjoys working with his four-legged partner because the energy he has is quite contagious, “he’s similar to a co-worker you may have that's always excited to be at work and always ready to go and excited to do something uh he doesn’t seem to have bad days at all”. Gus is just one of five dogs in his unit and one of four dogs used for “dual purposes”. Dual purpose dogs are tasked with various types of odor detection and apprehending people who prove to be a danger to officers. But like his handler, even Gus has an off-switch,“my working dogs nickname at home is Scooby Doo and I’ve got a couple little kids and they just absolutely adore him and think he’s this magical superhero”. 4-year-old Belgian Malinois, dual certified in drug detection and criminal apprehension, came from Europe. 3 years with the department. 7-year-old Yellow Lab, certified in drug detection, she was rescued from an animal shelter in central Idaho. 6 years with the department. 2.5-year-old German Shepard, dual certified in drug detection and criminal apprehension, came from Europe. 1 year with the department. 2.5-year-old Belgian Malinois, dual certified in drug detection and criminal apprehension, came from Mexico. 1 year with the department. 2.5-year-old Belgian Malinois, dual certified in drug detection and criminal apprehension, came from Europe. 1 year with the department. Before these dogs hit the streets they completed 160+ hours of drug detection training and received state certification. All dogs with the exception of Dory also underwent 240+ hours of criminal apprehension training and were state certified.